October 18, 2017 – Smithsburg, Maryland — MEDI+SIGN announces the recent designation of ResponderSync Partner by Rauland-Borg, a market leader in Nurse Call communication systems. MEDI+SIGN healthcare technology supports critical communication solutions to ensure safety of patients and plays an essential role in preventing errors and safety conflicts, fostering a safe healing environment for the patient. MEDI+SIGN connects nurse/patient communications through Digital Patient WhiteBoard Solutions designed to improve patient satisfaction and coordination of care. MEDI+SIGN technology meets the Rauland criteria for ResponderSync level of technology by visually identifying fall risks, creating better attentiveness, supports patient safety, isolates potential infectious patients and communicates patient status clearly to patient and family. 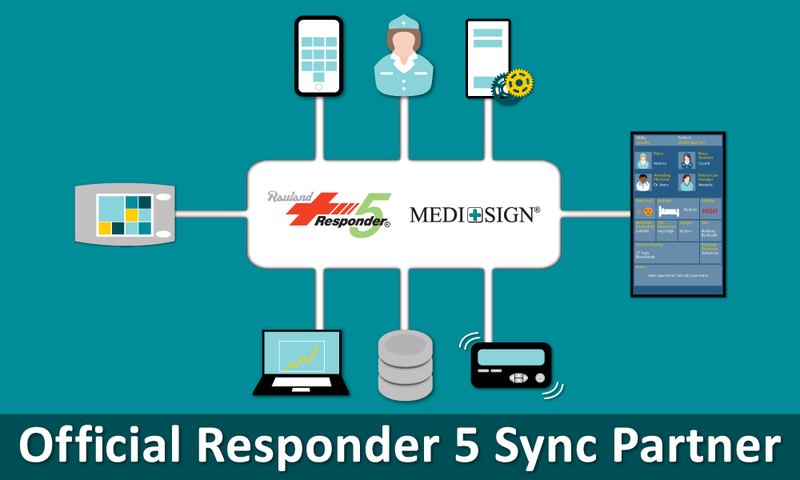 ResponderSync improves hospital staff workflow and communications between staff and patients. With the MEDI+SIGN partnership Rauland can now offer in-room Digital Patient Whiteboards that connect the nursing and administrative staff directly to the patient for a streamlined healthcare communications solution. Further details about MEDI+SIGN and its patient monitoring and digital whiteboard solutions are available on the company’s website: www.medisigndisplays.com. Questions or opportunities may be addressed through the website, or by phone (301-790-0103). MEDI+SIGN provides hospital and healthcare organizations with a connected health platform that includes patient monitoring and digital whiteboard display solutions. MEDI+SIGN is an integrator of electronic health records and remote monitoring systems to collect and communicate updated and accurate patient health and status information to care teams and patients. MEDI+SIGN was established to leverage its proprietary visual communication technology to improve hospital and healthcare provider’s performance in patient safety and satisfaction, as well as the overall quality and delivery of healthcare. For more information, please contact us at www.medisigndisplays.com. For over 80 years, Rauland-Borg has been the industry leader in the manufacture and design of communications and life-safety equipment for institutional environments. Rauland Responder® Nurse Call combines traditional nurse call components with the latest technology and software management tools. For more information on ResponderSync and other nurse call solutions, visit their website at:https://www.rauland.com/healthcare.